Thanks to Foresight Preconception for their help in compiling this list of books. Click here for more information about studies related to vaccination. of mandatory vaccines. In some regions, 1 of every 150 children is now autistic. We have a national and potentially worldwide epidemic on our hands. Autism often strikes following an early childhood of apparently normal development. Many parents believe thatchildhood vaccines, especially MMR (measles, mumps and rubella), are responsible. Some studies confirm that vaccines may cause autism in certain predisposed children. However, health authorities deny that autism is linked to vaccines. Some studies support their position. Congress recentlyheld several hearings to investigate the causes of, and cures for, this growing epidemic. The testimony hints at a medical coverup. This book chronicles Congressional efforts to expose the truth, summarizes vaccine studies on both sides of the debate, and provides parents with crucialdata to make informed decisions. Vaccines: Are They Really Safe and Effective? (the new, completely updated and revised edition, 2008) is a fully documented guide toimmunizations. It includes 30 charts and graphs plus nearly 1,000 citations so that all of the information may be confirmed. This bestselling vaccine handbook (more than 150,000 copies sold) evaluates each vaccine for safety, efficacy, and long-term effects. It contains some ofthe most comprehensive, up-to-date, uncensored data available -- information that many doctors don't even know. It includes recent studies, numerous case histories detailing vaccine-induced damage to children, and pinpoints for parents exact conditions that may put their own children athigh risk. It includes information on vaccine ingredients, natural versus artificial immunity, and provides data documenting correlations between MMR and autism, polio vaccines and cancer, the hepatitis B vaccine and multiple sclerosis, the Hib vaccine and diabetes, and much, much more. Inaddition, it outlines current vaccine laws and offers parental options to mandatory shots. Polio vaccines were contaminated with cancer-causing monkey viruses and administered to more that 100 million people. Sixty-two studies from 30laboratories around the world have linked these tainted vaccines to dramatic increases in brain tumors, bone cancers, lung cancers and leukemia (pp. 20-22). During the 1980s and 1990s, more than half of all measles cases in the United States occurred in people who were adequately vaccinated (p.29). Surveys in medical journals indicate that up to 87 percent of pediatricians and family practitioners do not believe the hepatitis B vaccine is neededby their newborn patients (p. 51). A recent study in the Journal of the American Medical Association has linked the chickenpox vaccine to serious adverse events, including neurologicaldisorders, immune system damage, and death (p. 54). The new HPV (cervical cancer vaccine) for young women has been linked to serious and life-threatening disabilities, including Guillain-Barre syndrome(paralysis), seizures, heart disturbances, menstrual irregularities, genital warts and vaginal lesions (pp. 69-71). According to the FDA, thousands of children are damaged or killed by vaccines every year. Families ofvaccine-damaged children were recently compensated more than $1 BILLION (p. 102). Parents, educators, and health professionals have very few sources of information permitting them to makeinformed choices regarding vaccines. But concerned parents are pleading for answers to their many questions. Doctors only tell them one side of the story; there is another side. Vaccines: Are They Really Safe and Effective? tells the other side and helps all concerned people to makewise and responsible decisions. Includes information on ALL recommended childhood shots PLUS smallpox, shingles, HPV and flu. Written by the editor of What Doctors Don't Tell You CLICK HERE tolink to more information about vaccination including research in the What Doctors Don't Tell You website. As we lurch from scare to scare about vaccines, we no longer fully trust what we are being told by doctors. In a series of investigations over seven years into all the new and commonly-prescribed vaccines (including HPV), autism, immunediseases and allergies, Dr Richard Halvorsen spoke to health officials, researchers, fellow doctors and parents. He discovered that vaccines are being given to children without knowing enough about them. Parents are regularly being misguided about vaccine effectiveness and their safety.Doctors are not being provided with the right information. They even live in fear of being seen to challenge perceived wisdom. Medical researchers often find that impartial vaccine research is impossible - those who dare speak-out, risk being discredited. By presenting all the originalmedical research in an easy, readable form, Dr Halvorsen allows parents to distinguish fact from fiction and make an informed decision about the right choice for their child. ... infectious diseases were over 90% resolved by the time vaccines came onto the market? ...there are now 33 vaccines that are mandated by the time your child is 6 years old? and 40 by age 16? ...that before 1991 there was no system in place for reporting adverse vaccine reactions whatsoever? ...that only one country in Europe still has mandated DPT shots, whereas the US still requires 4 separate doses? ... 43% of Gulf War veterans experienced side effects to vaccines? ... 80,000 Gulf War vets have permanent medical conditions as a result of vaccinations? ... that vaccination is not immunization? ... that Hepatitis B vaccine was outlawed in France after 15,000 citizens filed a class action suit against the government? ...that vaccines do not have to be proven safe and effective in order to be added to the list of mandated shots for American children? ...the the mercury in most vaccines is dozens of times in excess of EPA safe levels? .. that there are many new vaccines in the pipeline trying to get FDA approval so they can be tacked onto the mandated schedule? ... that vaccination is a multi-billion dollar industry in the US? ... that the US Congress has recently discovered rampant conflict of interest between the FDA and the vaccine manufacturers? ... that in the past 20 years, autism has gone from being almost completely unknown to an epidemic that now affects as many as one in every 150 American children? ... that the drug companies are not required to prove that vaccines will not cause cancer, and that no testing for carcinogenicity is even done before a vaccine is approved? Coulter considers the relationship of vaccination to autism, hyperactivity, allergies, autoimmune diseases, and learning disabilities. He carries his argument into the social realm, suggesting a connection between neurological damage and the present high level ofcriminality in American society. "Vaccination, Social Violence, and Criminality" will become a cornerstone in the ongoing debate about childhood vaccinations. Reviews works of several decades. It indicts present childhood vaccination programs as a major factor in immunologic and neurologic disorders in today's children. Evidence presented in these pages can no longer be ignored: we arelong overdue a reassessment of current childhood immunization programs." .,. "this thoroughly documented expose of the dangers of childhood vaccinations will shock our complacent society. If Dr. Coulter is correct--and his evidence if as compelling as it is alarming--parents, children and civilization itself are paying dearly for our uncriticalacceptance of inadequately tested medical 'advances.' This book will no doubt start an acrimonious but timely debate about the known benefits and hidden costs of childhood vaccination programs." "The BEST book on immunisations. Extremely helpful well rounded information in a very easy to read format. 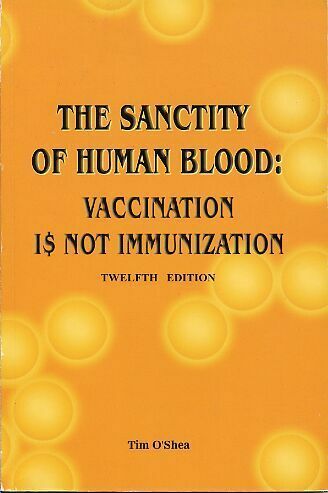 No technical jargon or over focus on historical infomration like other vaccine books. I would definitely recommend this to EVERYparent." "Incredibly helpful reading for any parent questioning routine childhood vaccination. Backed up with practical guidelines on caring for sick children - including important information on fever as one of the human body's responses to illness." This book takes its readers on a journey into the very heart of the hunt for viruses - to the key experiments originally performed to prove that these invisibly small particles are the cause ofdiseases previously blamed on toxins or bacteria and into the latest research. It sheds light on the extraordinary assumptions that underlay much of this research - and on the vaccines that developed from this. The author, an investigative journalist who has researched and produced investigative films for the BBC, American and Australian television, was asked by parents with children severely ill aftervaccination, to discover if the medical authorities were hiding anything from them. She agreed, but had no idea how long this search would take. She expected at best to uncover a small degree of contamination. On the ensuing decade-long journey of discovery, she learnt it is not just theadded mercury that we have to worry about. She discovered that the top government scientists admit to colleagues that vaccines are contaminated with viruses from chickens, humans and monkeys, with RNA and DNA fragments, with 'cellular degradation products', and possibly 'oncogenes andprions.' They report alarmingly that it is impossible to commercially purify vaccines. They express great concerns, but the public is not told despite the possible consequences for long-term public health. A recent US court decision has linked autismwith vaccine contamination. The author cites her sources by name - and gives references and Internet links where they are available. She reveals evidence that the World Health Organisation has discovered the MMR vaccine is contaminated with chicken leukosis virus, but has decided not to tell the public of this, and to continueto make the vaccine with eggs from contaminated chickens. She reports US biowarfare researchers tried to create new agents to destroy our immune systems - and worked on a bacterium to make it a hospital superbug. Did they manage to create HIV? A senior professor told her that the vaccineprogram was so contaminated that HIV might well have spread though it without any need for military intervention. She set out to find the evidence to resolve this, and to learn how HIV apparently spread so far and fast. She needed to know more about this virus so went to the foundationresearch widely held today to have found HIV and proved it caused AIDS. She was then rocked to discover that this same research was investigated for scientific fraud for a five year period by powerful US scientific institutions and by Congress,. Why is this not widely known? She found theirreports and discovered they found major errors in this research, some so serious that these made it impossible to repeat these experiments and thus to verify them! She reveals the evidence unearthed - reproducing key documents so the reader can assess them for themselves. This is explosive material. In the final part of this book the author reports recent research that is revolutionising biology and offering much hope for the future. These new developments shednew light on the relationships between our cells and viruses. They are not necessarily enemies. Readers may find these new developments radically change the ideas they have held about viruses since childhood. This book has over 500 references and includes several documents unearthed underFreedom of Information legislation. `It has a scientific glossary and is fully indexed..
Synopsis "So many pressures, opinions and concerns; deciding about vaccination is a huge worry." This is a balanced review of the facts to help parents decide between MMR, single vaccines or boosting natural immunity. Thisbooklet, written by a practitioner who has three young children, guides you through the facts and choices available for the best health of your child. "The Vaccine Guide" covers each disease and its vaccine, providing difficult-to-obtain facts about vaccine reactions. Also discussed are vaccine effectiveness, toxicity and adverse effects, legal requirements, alternatives, and the latest information on the threat ofbioterrorism. New to this edition are topics of particular concern to adults, including smallpox and anthrax vaccines, flu shots, and new conditions linked to vaccine reactions. ""The Vaccine Guide" is an excellent resource, providing the latest, most up-to-date, unbiased information for parents and physicians as they make decisions on safe immunization practices." --Mary N. Megson, M.D., F.A.A.P. "Aside from diet and discipline, no other issue concerns parents more today about their children's health than the safe use of vaccines. "The Vaccine Guide" provides a clear, well-balanced, and thoroughly researched review of vaccine use. I strongly recommend it for parents and health careproviders." --Robert Schiller, M.D. As Andrew Wakefield states in his prologue, "If autism does not affect your family now, it will. If something does not change--and change soon--this is almost a mathematical certainty. This book affects you also. It is not a parochial look at atrivial medical spat in the United Kingdom, but dispatches from the battlefront in a major confrontation--a struggle against compromise in medicine, corruption of science, and a real and present threat to children in the interests of policy and profit. It is a story of how 'the system'deals with dissent among its doctors and scientists.
" In the pursuit of possible links between childhood vaccines, intestinal inflammation, and neurologic injury in children, Wakefield lost his job in London's Royal Free Hospital, his country of birth, his career, and his medical license. A recent GeneralMedical Council ruling stated that he was "dishonest, irresponsible and showed callous disregard for the distress and pain of children." Maligned by the medical establishment and mainstream media, Wakefield endeavors to set the record straight in Callous Disregard. While explaining whatreally happened, he calls out the organizations and individuals that are acting not for the sake of children affected by autism, but in their own self-interests. The denial of vaccine damage by government, corporations and the media. Particulaly related to the work of Dr Andrew Wakefied regarding vaccine damage, autism, and the effects on the gut. Written by the parents, and published by SlingshotPublications. With a complimentary copy of Alan Goldings hour long DVD. Watch the youtube video of some of the parents reading their stories from the book. In this groundbreaking work, European Homeopath Dr. Tinus Smits reveals the step-by-step method which he has used for more than 300 autistic children. In many cases,the parents have declared their children 100% cured; in others, the process is still underway with significant improvement. His therapy is primarily based on Isotherapy, a form of homeopathy which is able to address the multiple causes of autism in children and correct them directly. He hasmade remarkable discoveries as to why autism is on the increase. This book is highly important for parents with autistic children and for all those who are involved in the care of these children. Homeopathic practitioners will find clear direction on protocols for case management and forusing Isotherapy to treat autism, including precise dosing methodologies.